Hydraulic cements are our most important building materials. More than 2 billion t/a Ordinary Portland Cement (OPC) are produced world wide. Most of this material is consumed by concrete production and building chemistry formulations. Both are complex systems made from inorganic cement components, aggregates and organic additives. The organic additives yield the ability to minimize the amount of used cements which are produced by a huge input of energy (energy saving and minimization of CO2 emission). 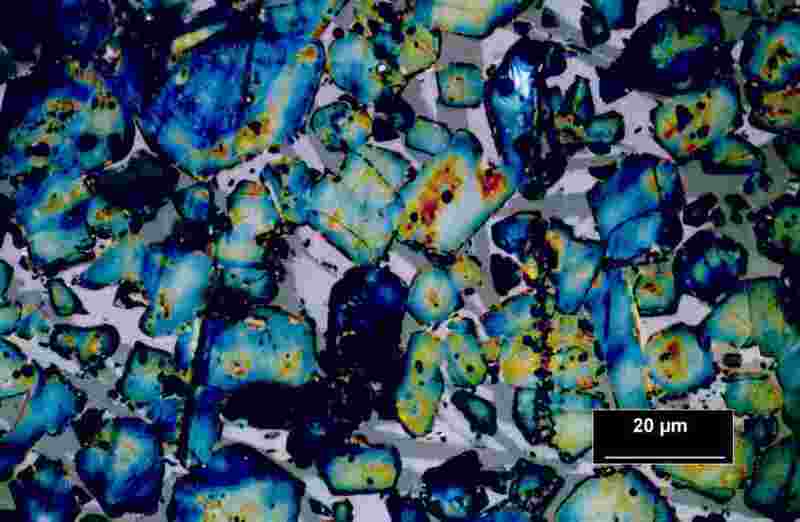 The picture above shows the thin section of an OPC clinker. 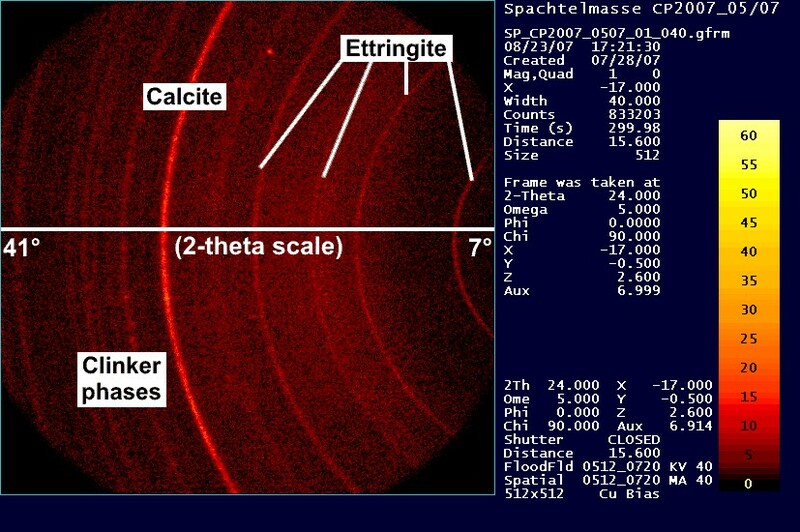 By etching of the surface the clinker minerals are clearly to distinguish. The physical properties of the hardened cement are strongly influenced by the mineralogical composition (phase composition). The interaction of inorganic cement phases and organic molecules are in focus of our investigations. The early hydration behaviour of cementitous formulations are investigated by in-situ XRD analysis. 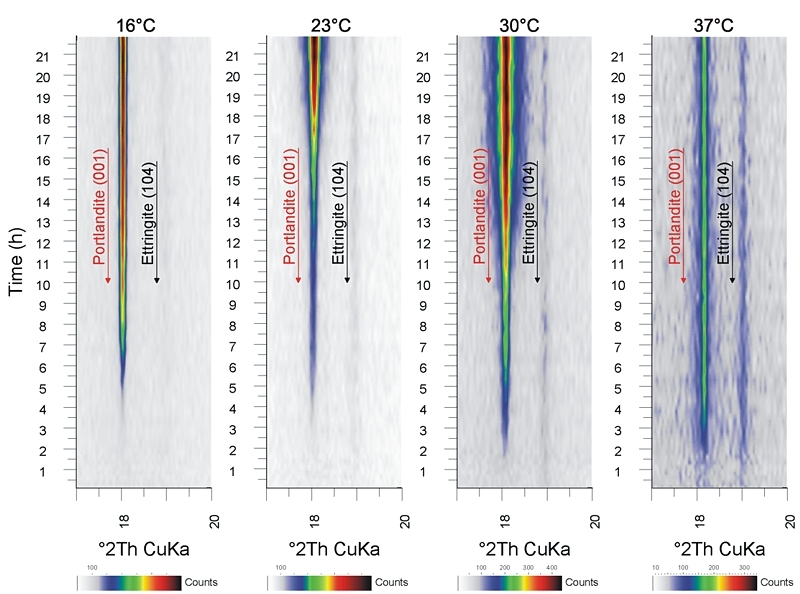 The evolution of the phase content – starting from the clinker phases forming nano scaled hydration products – is recorded time dependend and is evaluated quantitatively. 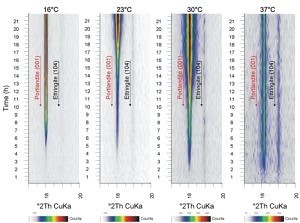 The linking of these results with the data of the calorimetric investigations are the basis of the development of new models of the interaction of organic additives and inorganic cement phases. The characterization of the solid cement stone allows statements with respect to its nano crystalline framework and its directly linked physical properties. Ordinary Portland cement (OPC) clinker consists of several hydraulic cement phases. The main phase of OPC, tricalcium silicate (C3S), is often used as a model substance for Portland cement hydration. The focus of the project lies on the investigation of early C3S hydration. On mixing C3S with water a short exothermic reaction takes place. This is followed by a so called “induction period” during which nearly no heat is released. 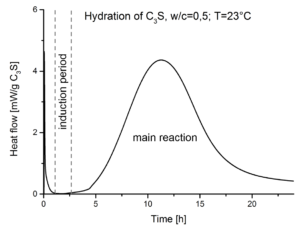 The main hydration period of C3S takes place after the induction period (Fig. 1). The mechanisms that lead to the development of this induction period are still a subject of debate. One hypothesis describes a lowered dissolution rate of C3S during the induction period. Another hypothesis describes a passivating metastable hydrate layer that forms around the C3S grains. The main goal of the investigations is to clarify whether such a passivating hydrate layer forms on the C3S surface. 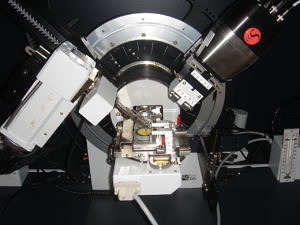 For this purpose atom probe tomography is used to analyze hydrated samples of monocrystalline C3S. Furthermore the development of the phase content during hydration is monitored. This includes the dissolution of C3S and the formation of the hydration products portlandite and C-S-H. Additionally the pore solution is analyzed. The used methods include in-situ QXRD, CP-MAS NMR, ICP-OES, SEM, thermal analysis and isothermal heat flow calorimetry. 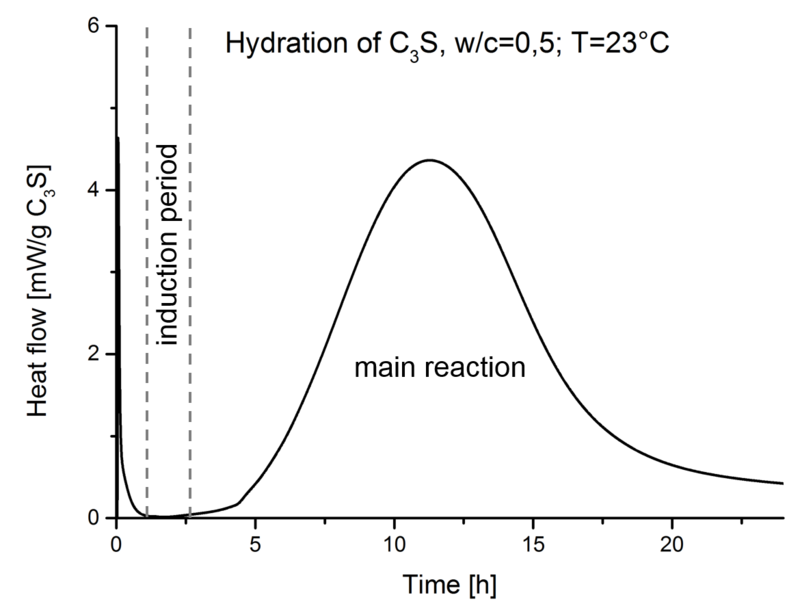 The obtained data are used to derive a mathematical model for the hydration of tricalcium silicate. Exemplary heat flow of alite hydration. 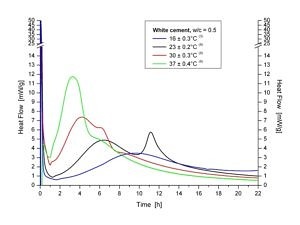 The research is focussed on the influence of different polyvinyl alcohols (PVA) and polymers on the hydration of ordinary portland cement (OPC). 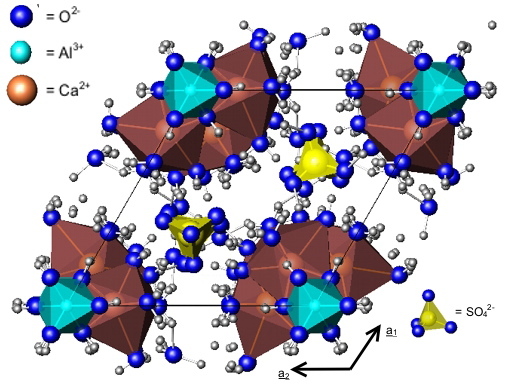 In praticular the change in dissolution rates of the hydrating cement phases alite, tricalcium aluminate and calcium sulfate are determined as well as the differences in the kinetics of the ettringite formation. Both parameters are of great importance for the understanding of the interaction between organic additves and the different inorganic cement phases. 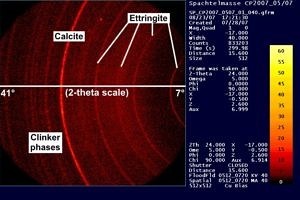 The influence of PVA and other polymers on the crystal morphology and the crystal structure of ettringite and monosulfate has to be observed experimental. influenced mainly by the PVA concentration and with less importance by the kind of the PVA. 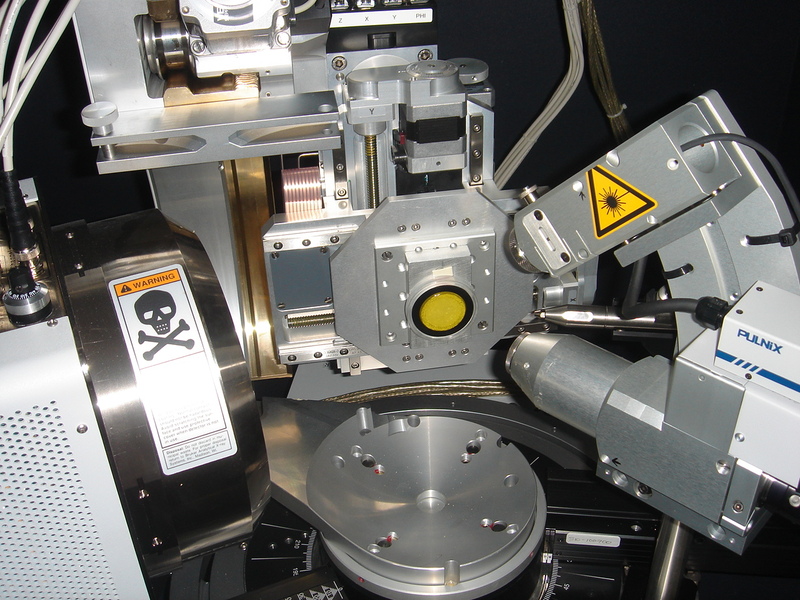 With the help of the in-situ XRD basic data on the time resolved hydration of OPC with respect to the differnet PVAs are collected. 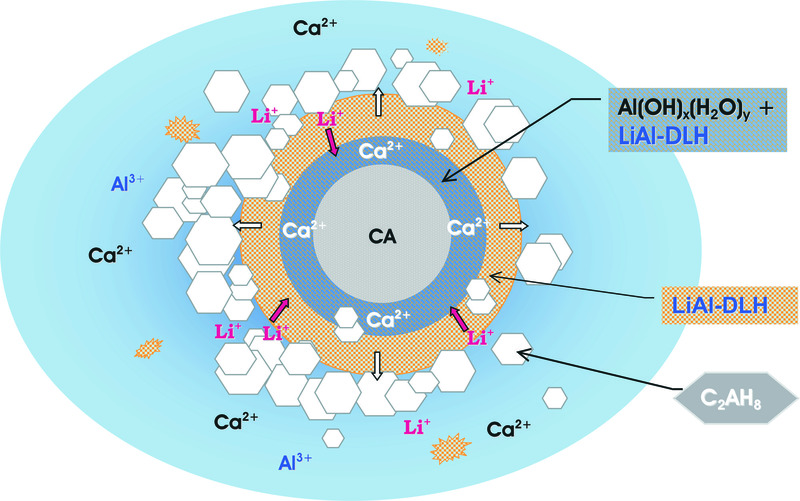 The refinement of the lattice parameters a and c of the ettringites which are formed up to 22 h of hydration yield a significant correlation with the dosage of the PVA. Self-levelling compounds (SLC) are widely used for renovation to create smooth ground surfaces. There are high demands for such dry mortars during application and final properties. The physical properties like surface durability and adhesion to the ground are strongly depending on the microstructure in the hardened mortar. There are strong gradients in the water content within the liquid SLC, which may lead to inhmogenities inside the the mortar bed. 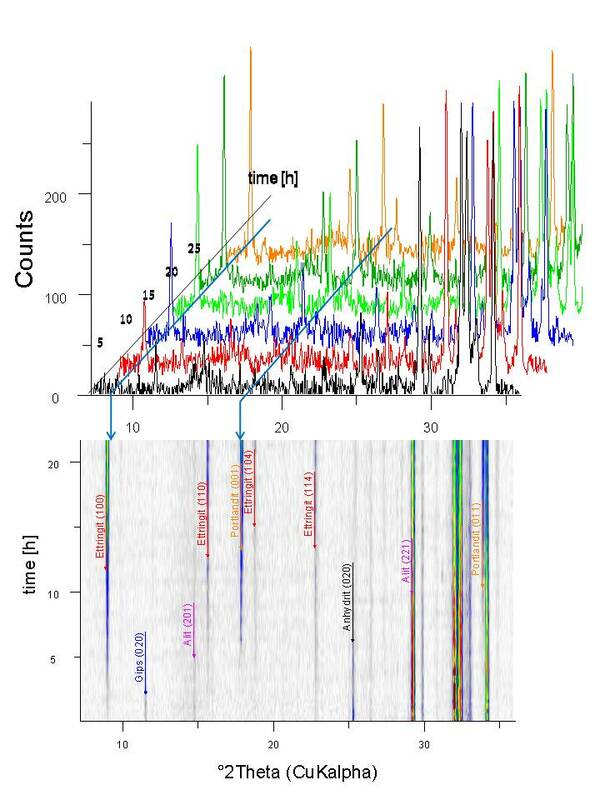 We focus on the investigation of the depth dependend phase distribution, especally of the forming hydrates. 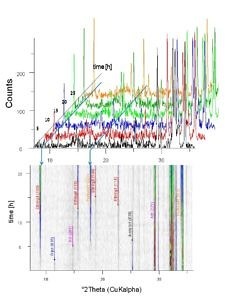 With standard Bragg-Brentano techniques it is not possible to get the desired position sensitivity. 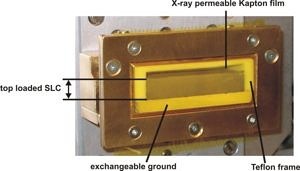 A General Area Detector Diffraction System (GADDS) gives us the ability to investigate the phase compsition of an SLC in-situ with a high position sensitivity. 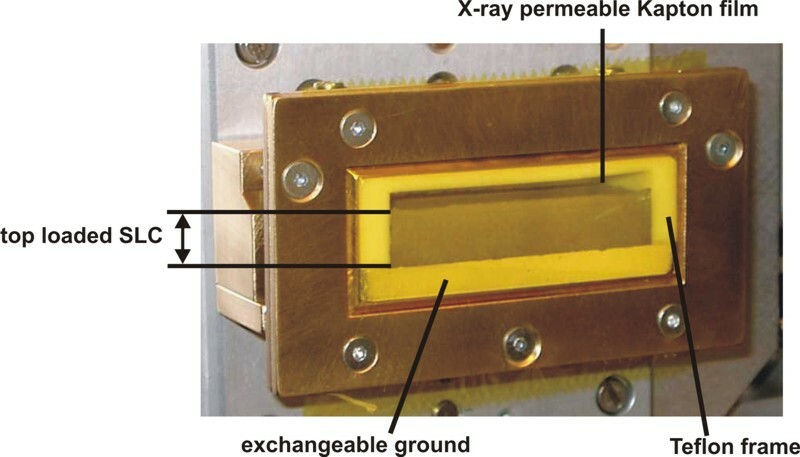 The point focussing X-ray optics with parallel beam optics together the HiStar detector gave us the possibilty to determine the phase composition within the SLC in slices down to 50 micron. 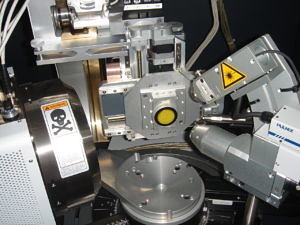 The socalled GADDS frames were converted to conventionel XRD pattern, which may be evaluated by standard techniques. 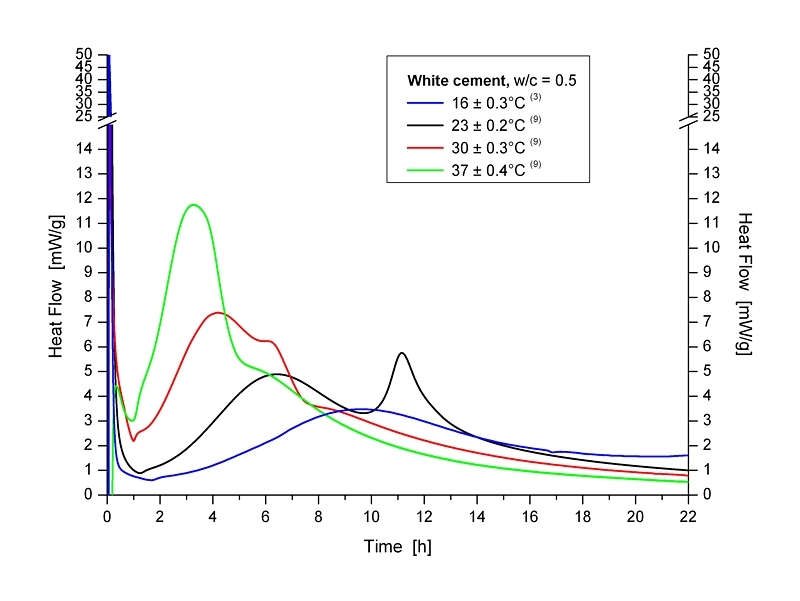 Differences in the quantitative phase distribution near the ground surface and near the top surface give information on the properties of the water reducing agents in the formulation. At first contact with water the hydration of Ordinary Portland Cement (OPC) starts without delay. The hydrated phases which are formed determine the strength development of the hardened cement. 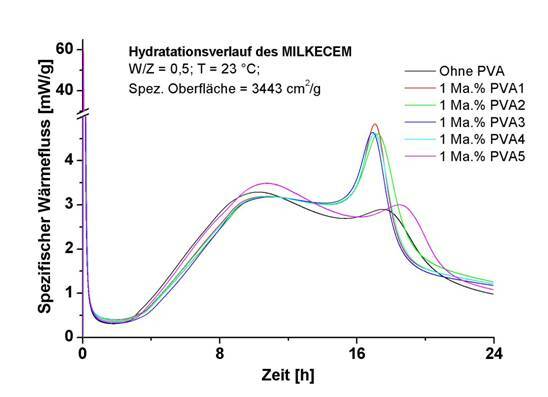 For basic understanding of the early hydration reactions the hardening of the cement is observed (Diffractometer equipped with SolX detector) and the time dependend phase content is determined by Rietveld-refinements. The change in phase content allows evidence about the reaction mechanisms. 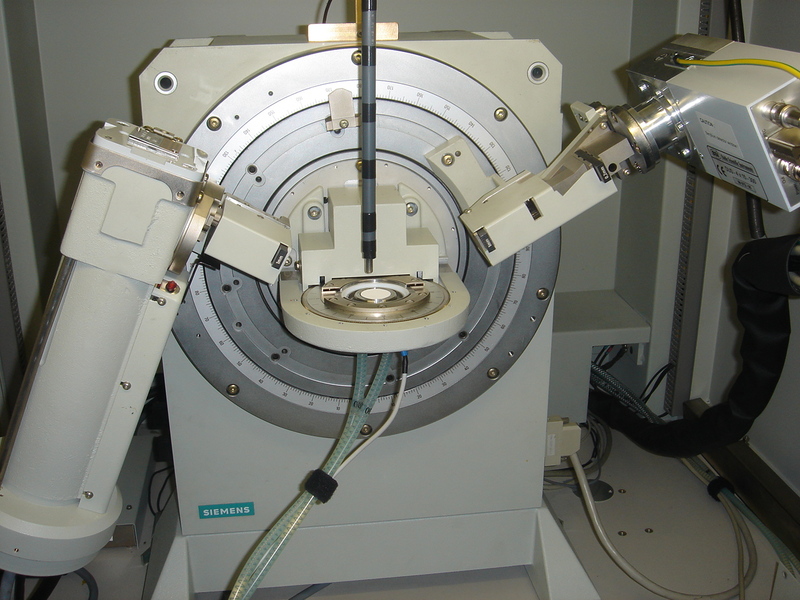 A custom made sample holder for the diffraction experiments allows the investigation of the hydrating cement pastes in a temperature range between 16°C and 37°C. The temperature may be controlled very accurate with 0,2°C. 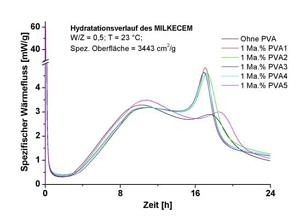 Changes in temperatures lead to changes in hydration kinetiks, which give us the opportunity to check our evidences about the reaction mechanisms. The investigations should help to understand the influence of additives (inorganic or organic) the the hydration of the cement. Concrete formulations as well as dry mortar systems may be improved by this new knowledge. The high demand for fast setting cements create a wide range of special products. The classic rapid setting mortar contains ordninary portland cement (OPC) besides calciumaluminate cement (CAC). 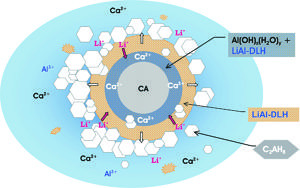 The minor component CAC acts as an accelerator for the more slow reactive OPC. The demand for fast setting products is increasing especially the white qualitie which are containing white cement (WC) instead of OPC. A smooth and sufficient workability is as important as the early strength development. The investigations are carried out with cements which are produced from synthesized lab made model clinkers. Special attention is paid to the sulfate carrier which controls the setting. 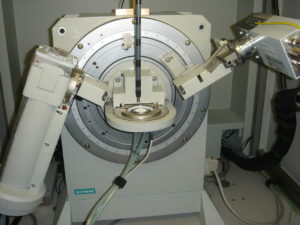 The functionality of the synthetic cements is checked by in-situ XRD of the paste hydration and by calorimetric investigations. The aim is always to maximise the conformity of the synthetic cement and the technical product. The investigation of the influence of citric acid and the kind and the amount of Ca-sulfates (anhydrite II, anhydrite III and bassanite) on the hydration of WC/CAC mixtures are in focus of all experiments.